This entry was posted in News on March 25, 2015 by Ivan Churakov - admin. On the morning of the seventh day on the ski stadium CMM was lively – athletes preparing for the final race in this Cup, and therefore the last opportunity to win medals. 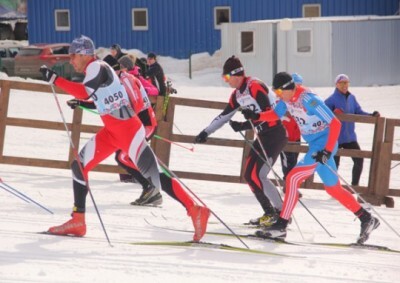 Depending on the age category of the participants overcame 15 to 45 km classic course, considered the most difficult in skiing. The newly among women compete with Russia was Italy, Kazakhstan, Sweden, Denmark and Norway. Among men, more skiers from Russia were athletes from Finland, Germany, Switzerland, Sweden, France, Norway and Canada. Today’s race can be called the most internationally for all seven days of the World Cup cross-country skiing masters in Syktyvkar: athletes of all seventeen countries started today in the marathon. According to fans and volunteers on the track was a close contest for prizes. In the evening at the Center of martial arts took place the closing ceremony of the World Cup Masters XXXV, where the flag was handed over to the Association of skiing Masters. 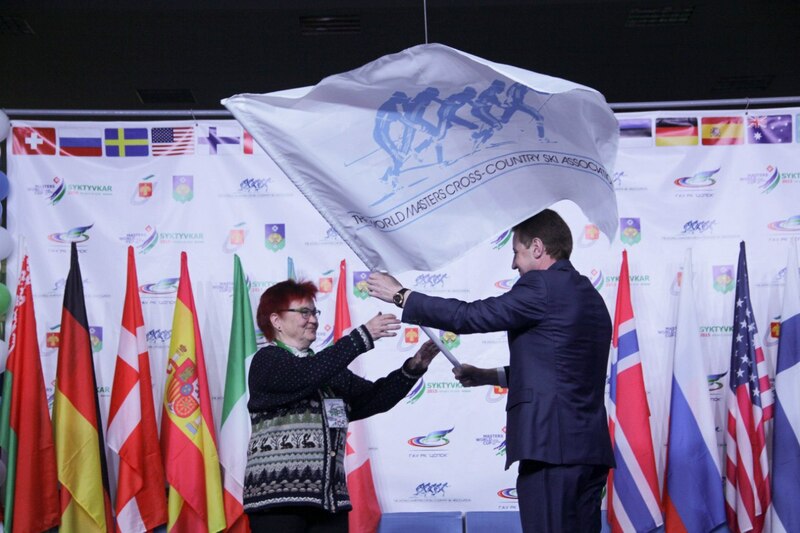 Syktyvkar mayor Ivan Pozdeev handed over the flag of competitions delegation from Finland, where will be a new MWC event in the next year start. This entry was posted in News on March 21, 2015 by Ivan Churakov - admin. This entry was posted in News on March 19, 2015 by Ivan Churakov - admin. 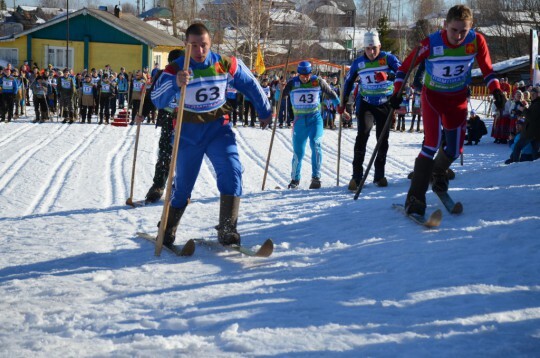 On March 17 in Kortkerossky area passed competition “Lyampiada” in the Komi national sport – ski race on hunting skis and Lampe. Some participants of Masters World Cup of x-ski racing took an active part as a fans in this fascinating sports festival. This entry was posted in News on March 18, 2015 by Ivan Churakov - admin. This entry was posted in News on March 16, 2015 by Ivan Churakov - admin. This entry was posted in News on March 15, 2015 by Ivan Churakov - admin. More than 340 athletes from Russia, Austria, Germany, Estonia, Switzerland, Sweden, Norway, Italy, Denmark, Spain, Kazakhstan, the USA, Belarus and Finland came out today to start at various distances classical course in their age groups. Tomorrow competition day is divided into two parts: in the morning (10.00) skiers overcome a distance of 5 km and 10 km classic starts at 14.00 assigned freestyle. Recalling that in the framework of the World Cup by the Agency for Physical Culture and Sport announced a competition on the social network «VK» https://vk.com/kmm2015. 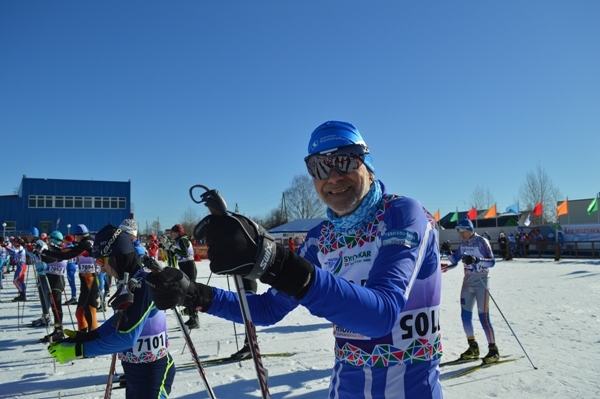 March 14, the first start of the World Cup Masters in Syktyvkar. Most medals won by representatives of the Russian national team, but in a number of races wins went to foreign athletes. Women competed at distances of 10 km and 15 km freestyle. Men ran 15 km and 30 km freestyle.